On Tuesday, President Obama announced that the newly formed Syrian Opposition Council is the only “legitimate representative” of its country’s people. This was a big step as the international community has increased its efforts to end Syrian President Bashar Assad’s reign. By recognizing the Syrian Opposition Council, the U.S. joins Britain, France, and other Arab allies to recognize the Syrian rebel group. The U.S.’ recognition comes as the Syrian government appears to have backed off using chemical weapons against rebel forces and after it was reported in the U.S. last week that the Syrian government might do so. With this upgraded status, the Syrian Opposition Council will now receive more humanitarian and non-lethal aid from the U.S. The U.S. may add military support for the rebel group too. President Obama commented how the recognition comes with responsibilities and that the Syrian Opposition Council must “organize themselves effectively” and make sure “that they are representative of all the parties” including women and minority groups. Another cautious element to recognizing the rebel group is the link between many who oppose the Assad regime and al Qaeda in Iraq. For the first time on Tuesday, the Obama administration recognized an al Qaeda terrorist organization, Jabhat al-Nursa, as being directly tied to a powerful Syrian rebel group. The U.S. sanctioned the terrorist group, freezing any assets it may have in the U.S. and preventing Americans from conducting business with it, out of fear that the group is becoming stronger than other rebel groups and could potentially overtake Assad’s regime in Syria. The U.S. Treasury also publicly identified two Jabhat leaders by name for the first time on Tuesday, sanctioning them for their ties to al Qaeda. The U.S.’s recognition of the Syrian Opposition Council comes a day before an international conference in Morocco. The focus of the conference is to bring together 80 nations to support Syrian opposition groups. While Secretary of State Hillary Clinton was expected to attend the conference, she has since canceled her trip due to illness. Deputy Secretary of State William Burns will attend in her place. 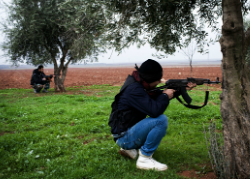 Some critics have argued that the U.S.’s formal recognition of the Syrian rebel groups may be too little too late. For instance, the recognition does nothing to change the military equation inside Syria. President Obama’s move also does not give the opposition the legal authority of a state—the rebel forces may not have access to Syrian government money, take over the Syrian embassies globally, or enter into binding diplomatic commitments. While the fighting inside Syria has intensified, it is unclear how this formal recognition will influence the Syrian Civil War. What is known is that the U.S.’s formal recognition of the Syrian Opposition Council is meant as a “political shot in the arm for the opposition.” More will soon be evident as the international conference takes place in Morocco later this week and as the fighting intensifies with each passing day. Reports indicate that over 40,000 people have died since fighting began back in March 2011.